Suprime-Cam has ten fully-depleted-type 2048x4096 CCDs manufactured by Hamamatsu Photonics KK (S10892-01), which are arranged in a 5x2 pattern, providing a field of view of 34' x 27'. 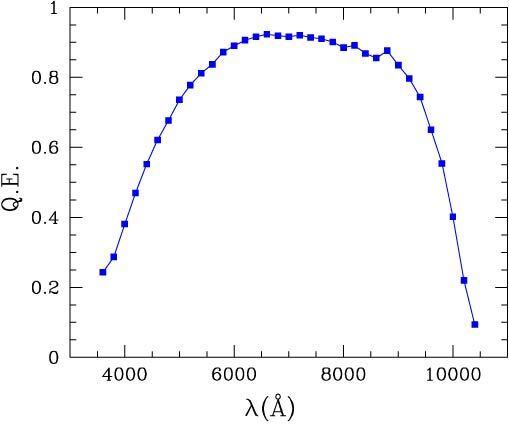 The following plot shows the quantum efficiency of a typical CCD. Small gaps exist between the CCDs due to the coplanarity requirement at the prime focus of Subaru Telescope. The following diagram indicates the approximate sizes of the interchip gaps. Data from each individual chip are stored separately, and thus one image from Suprime-Cam consists of ten FITS files. Each chip has a one-digit detector ID, recorded in the FITS keyword DET_ID. Each chip also has a "call name" consisting of a series of characters and numbers which are recorded in the FITS keyword DETECTOR. DET_ID corresponds to the final digit of the FRAMEID which is a sequencial number (SUPA***) assigned to each FITS file in the data archive system STARS/MASTARS and SMOKA (e.g., DET_ID=8 for FRAMEID=SUPA00157008). Copyright © 2000-2009 Subaru Telescope, NAOJ. All rights reserved.